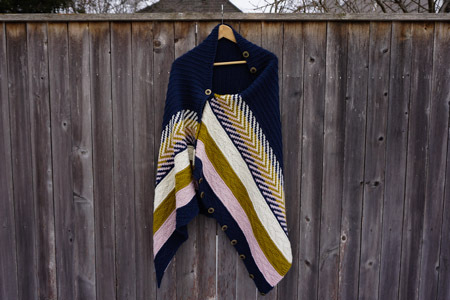 I first heard of the Om Shawl pattern around Rhinebeck time, when this beautiful one knit by Yarnmonster Jesse was spotted by several friends at the fairgrounds (I wasn’t there, but saw the photographic evidence). A little while later, an occasion came up to knit something blanket-life-ish for a friend, and I thought the Om Shawl would be a great match. 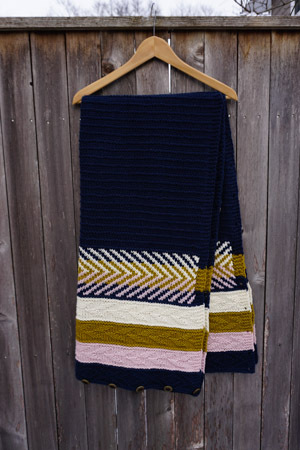 Pattern: Om Shawl by Andrea Mowry. Yarn: O-Wool Classic Worsted in Lake Erie, Wood Dove, Mustard Seed, and Natural. Lovely yarn that strikes just the right balance between being soft and rustic. It was a delight to knit, the colors worked so nicely together, and I was able to wash it in the washing machine (on gentle)! Even though I used the exact yarn and needles recommended in the pattern, I ran out of the main color and had to buy an additional skein! And I ran out by a lot, not just a few yards! All together, the shawl used up about 1270 yards of yarn. Needles: US 10.5 for the main portion, and US 11 for the Fair Isle. I read somewhere to size up for the Fair Isle portion and that’s excellent advice. 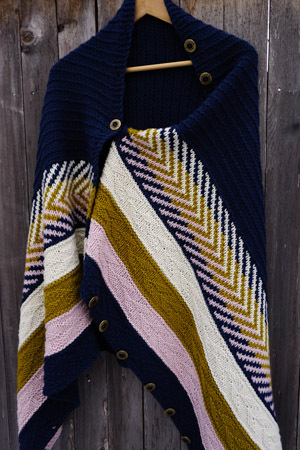 Even with sizing up, this shawl drew in slightly at the Fair Isle sections. Finished Dimensions: a whopping 30″ by 60″! That’s huge! And the final weight was about 640 grams without buttons, and 750 grams with 19 metal buttons! I knit much of this shawl during our very cold December, and it was very pleasant to have the fabric warming me as I knit. That is so beautiful. The pattern is very nice and your colors are wonderful. The chevron section with the blend of colors is amazing. Thanks for sharing. Blanket bliss! That looks so cozy. Your friend is very lucky!